Posted on 1, August 2016 by EuropaWire PR Editors | This entry was posted in Germany, Internet & Online, Investment, Transportation & Logistics and tagged $137 million investment plan, Charles Brewer, Deutsche Post DHL Group, U.S. domestic and cross-border e-commerce market. Bookmark the permalink. BONN, 01-Aug-2016 — /EuropaWire/ — Deutsche Post DHL Group today announced a $137 million investment plan for the U.S. domestic and cross-border e-commerce market. The Group’s objective is to exploit the global B2C e-commerce market for shipments crossing borders which is expected to grow from $400 billion today to a total global volume of $1 trillion in 20201. Since U.S. online merchants take the leading role in selling internationally, DHL eCommerce will make substantial investments in the United States in the next years and expand its capabilities to serve businesses selling abroad significantly. The announcement was made in conjunction with the DHL eCommerce and DHL Supply Chain divisions further implementing regionalized fulfillment centers in Los Angeles, Columbus, Ohio, and New Jersey, significantly increasing the companies’ order fulfillment capabilities in North America collaboratively. “There is barely any other industry that provides such a promising outlook than the e-commerce business. It is expected that one billion people will shop online and across borders by 2020 with the U.S. being the most popular origin for 25 percent of consumers worldwide. With our investments we lay the foundation to expand our leading role in cross-border e-commerce logistics, serve our U.S. customers with the best possible infrastructure and solutions, and gain future market shares,” says Charles Brewer, CEO DHL eCommerce. DHL eCommerce is looking to profit from these developments and to increase its e-commerce footprint in the United States. In line with the Strategy 2020, the Group has made and will continue to make significant investments. After the first order fulfillment center opened in Columbus, Ohio, last year and followed by a facility in Los Angeles, DHL eCommerce will establish further regional centers of this kind in New Jersey and other locations in 2017. Additionally, DHL Express celebrates the opening of a new, $1.3 million service center facility in Chicago to meet heavy demand from e-commerce customers. And just one year ago, also DHL Global Forwarding opened up a $35 million distribution center in Chicago. All of these infrastructural engagements will provide merchants with the opportunity to place inventory closer to consumers in order to speed-up delivery. Today’s global B2C cross-border e-commerce market comprises approximately $400 billion and is expected to expand rapidly. Particularly emerging markets are going to fuel the estimated annual growth rate of 28 percent, followed by Western Europe and North America. Thanks to China’s growing middle class, which will reach 630 million people by 2022, most of the purchasing power will come from Asia-Pacific and equal about 48 percent of the total volume. Research shows that consumers increasingly buy products online that are either unavailable or too expensive in their home country. The biggest share of these cross-border purchases will revert back to U.S. e-commerce businesses, among other reasons because consumers covet products tagged with the “Made in the U.S.” label. DHL is looking to benefit from these developments and increase its e-commerce footprint in the United States. The planned expenditure of $137 million until the end of 2020 will be used for the further expansion of fulfillment capabilities by adding eight distribution centers and enhancing two existing facilities in Los Angeles and Columbus, Ohio. The new investment will also expand day definite deliveries and enhancements to support domestic and international services. “We provide the most comprehensive e-commerce platform for international trading ventures, thanks to our different divisions’ expertise along the entire supply chain, whether it is warehousing or transportation. For consumers shopping abroad, and also for businesses, it is of utmost importance that international deliveries are reliable, safe and convenient. We provide that with our network every day in every way,” Brewer continues. As an arm of the division Post – eCommerce – Parcel, expanding businesses’ international footprint with e-commerce related logistics is at the core of DHL eCommerce. In North America, the company operates 20 distribution centers, including four international gateways and one center each in Toronto and Mexico City. Further facilities in Latin America are to follow next year. In the U.S., DHL eCommerce operates 18 distribution centers and is one of the largest partners of domestic provider USPS. It is thus able to dive deep into the USPS mail stream to maximize pre-sorting discounts and achieve speed-to-market. 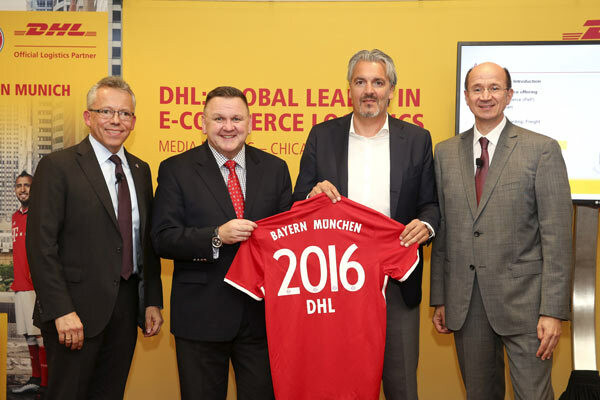 Internationally renowned German soccer club FC Bayern Munich welcomes DHL’s increased U.S. e-commerce capabilities due to the new investments. During the team’s summer tour through New York City, Charlotte and Chicago the Bavarian club confirmed that they want to further increase their fan base in the U.S., and to provide their followers with their latest merchandise items, such as the new jersey and other club related articles. Only last year FC Bayern Munich launched their Asian online shop together with its Official Logistics partner DHL.